Pragjyotish College Guwahati Recruitment 2018 September | Guest Lecturer (Contractual) :- Pragjyotish College Guwahati has issued a recruitment notification in the month of September 2018. 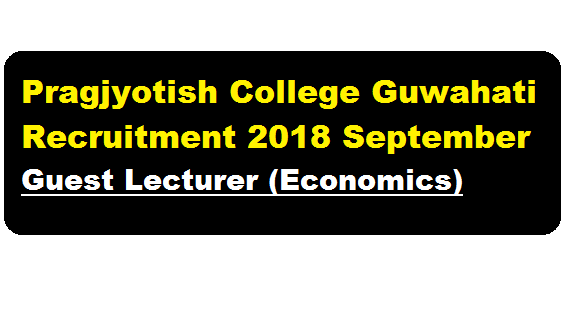 According to the latest Pragjyotish College Guwahati Recruitment 2018 September , applications are invited from eligible candidates for 2 post of Guest Lecturer (Contractual) in the Department of Economics having UGC norms with PhD/NET/SLET. Preference will be given to the candidates with PG teaching experience Remuneration will be paid as per as college rules.